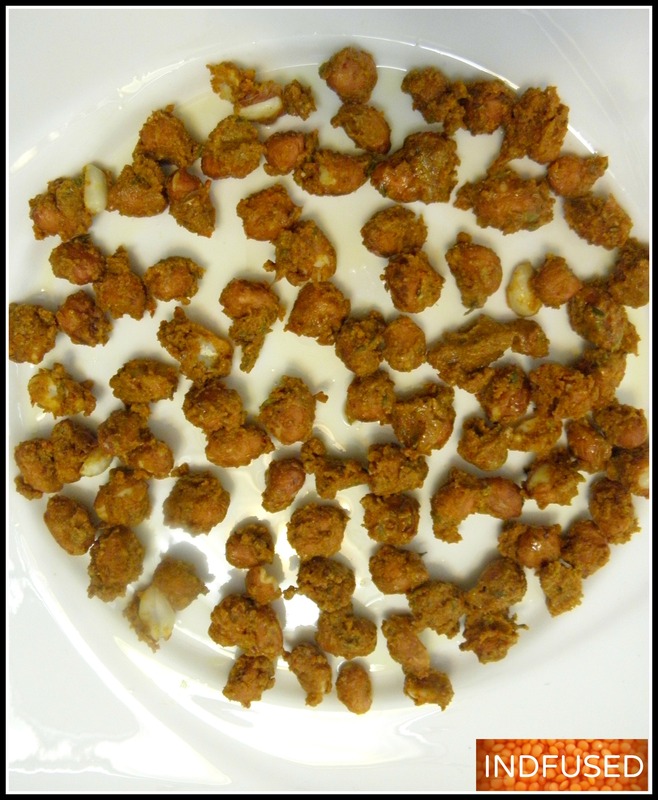 Masala Peanut Bhujias in the microwave! I like the tradition of afternoon tea in India where tea is served with some snacks. I feel that the relaxed atmosphere of teatime with friends is good for the soul too. 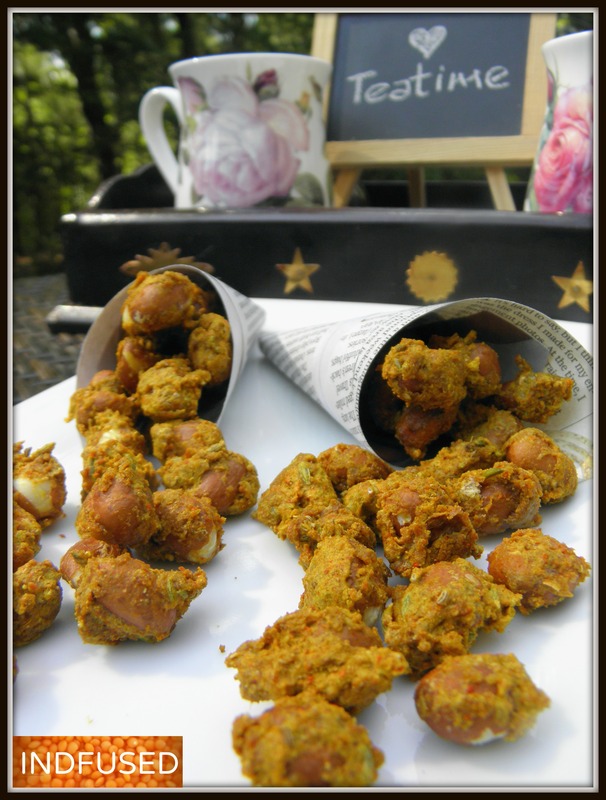 On a recent weekend afternoon, when I realized that we did not have any savory snacks to nosh on, I made these Masala Peanut Bhujias. With the magic of the microwave, this scrumptious snack was made in 4 ½ minutes. So by the time the bhujias cooled down and became crispy crunchy, tea was ready! Can you believe that you can have this crunchy, savory snack ready at your fingertips, whenever the mood strikes? And did I mention it is not deep fried, like it’s original version? This favorite snack of mine always beckoned me from the Indian grocery store shelves. I had to avoid all eye contact with the bhujias, to avoid the temptation of buying them. I knew fully well that I would eat the whole bag in the car itself, even before I reached home. Yes, experience taught me this as that ‘strong will’ worked only on days that I went to the store on a full stomach. Does that happen to you or is it just me? But now thanks to this recipe, I can have the bhujias anytime.Spices like the saunf and ajwain, not only give it a distinct taste, but help with digesting the peanuts and besan also. That is why I added them to the mix! My microwave took a total of 4 ½ minutes. Do try the timings with your microwave. Do not let the bhujias overbake or they will harden. The bhujias get crispy when they cool. These make great appetizers for a party too. You can also make these in advance and store them after they are cooled. 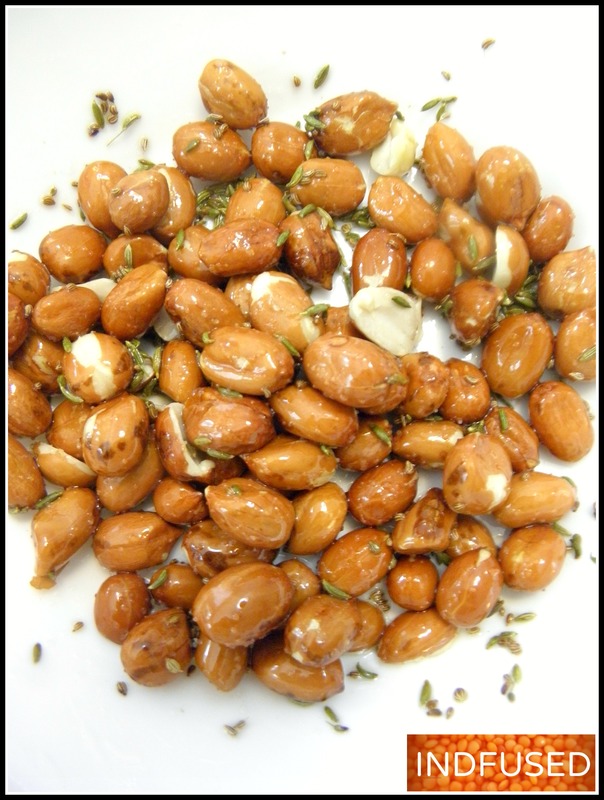 In a microwave safe bowl, add the oil, saunf, ajwain seasalt and peanuts. Mix to coat the peanuts. Microwave on high for 1 minute. Stir and microwave for another 30 seconds. Remove bowl from microwave. Add the besan, turmeric powder, red chili powder, the coriander seed, cumin seed and aamchur powders.Toss to coat the peanuts. Gradually add the water so the batter coats the peanuts. I needed 2 tablespoons of water. 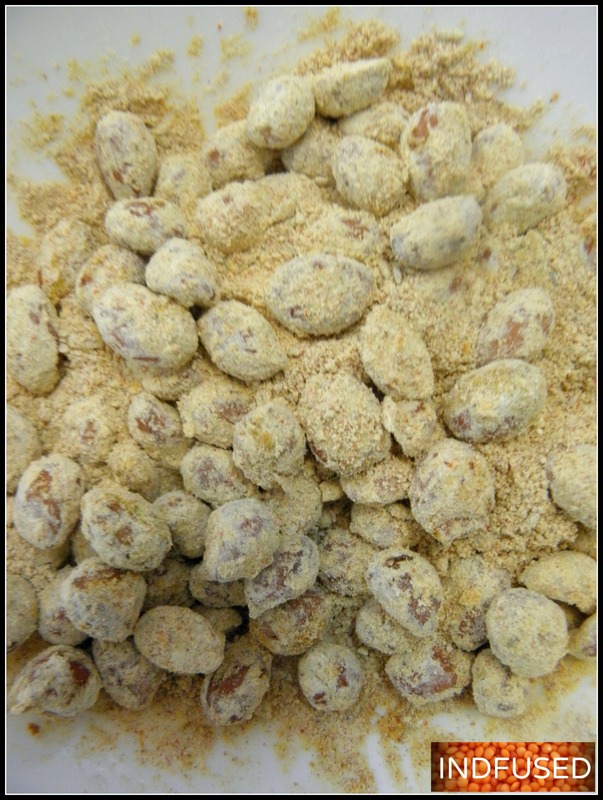 On the greased, microwave safe plate, drop the batter coated peanuts. Let the Masala Peanut Bhujias cool. Note: Individual microwave timings may vary. The timings given are for a 100W, 110V microwave drawer. Adjust the timing according to your microwave. Enjoy this quick and easy protein snack! You can’t get faster than that 🙂 They look flavorful, crunchy, and delicious Sandhya! They look so crispy and crunchy. Just like how you get at the sweet stores. These sound amazing!! I can’t wait to add them to my snack repertoire. Thanks ! Do let me know how you like them! I am so amazed at how many things are available online these days. I have an Indian grocery store in the next town where I get my ingredients. This is a savory ,crunchy and yummy snack! Do try it! These look wonderful! I am new to Indian cooking but I love, love Indian food in restaurants. In the cookbooks I have, so many Indian treats are deep fried. Is it possible to bake them in the oven or in the microwave like you have done here?? Well, like Medu Vada or any of the crispy fritters made with urad dal that are deep fried. I know I would love them as I love DOSA so much. But, I hesitate to do much of deep frying so I have not made those kinds of things. But I would make them and their different versions, if I could bake them or even sallow fry them. Some of those kinds of things are also made into main dishes with gravies, something I find very interesting. Pamela, I do bake the koftas that go into gravies. Medu vada does taste the best deep fried but a version of it in a appe pan can be made with a couple of drops of oil. Wow, must have that today! Do let me know how you like them Greg! Made them today. They are great! Can’t stop eating them! I am so glad that you enjoyed them Greg! Made this today and it turned out great! Thank you so much for letting me know . Really appreciate the feedback!